This CD declares itself as volume 1 of The British Symphonic Collection. It also arrives on the scene out of the blue. Usually you get to hear in advance about something as rare as this. There is also the implicit promise of something declaring itself as Volume 1. I discovered its existence when I happened to browse through Records Internationals on-line catalogues. Gordon Jacob wrote a great deal of music in all media except opera. His wind band and brass band music was and remains very popular. He was a classic journeyman composer writing to commission and to inspiration as necessary. Strangely he developed a somewhat monochrome image amongst the British music establishment. He was a reliable but low key producer of satisfying music. People forgot works of the calibre of the Second Symphony and who knows what else remains to be heard. The disc comprises a set of recording premières. I knew the second symphony from an off-air tape (CBCSO/Eric Wild) and the Little Symphony from a dim and distant tape of a performance (possibly the première) by BBC Scottish conducted by the very young Colin Davis. I had never heard the Festival Overture in any form. 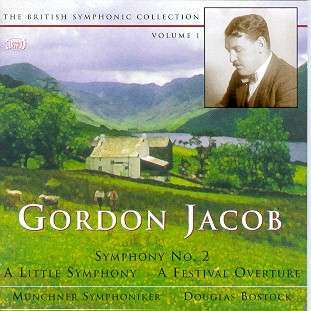 The symphony is one of Jacobs war symphonies (there are only two) although the first movement gives the impression of being busy and vigorous rather than racked with the extremes of turmoil and conflict. This is a more restrained statement than (for example) Arthur Benjamins or Hubert Cliffords 1940s symphonies. The first symphony, which I suspect is also worth a recording, dates from the early 1920s and is dedicated to his brother Anstey who was killed in the Great War. Both symphonies (there is no third - at least not numbered as such - though there are at least two sinfoniettas, a symphony for strings and a sinfonia brevis) are therefore prompted by the two world wars which racked this pre-Millennial century. The second movement adagio has a slow-moving, Bach-like majesty - grieving and high-minded, entering at times into a modernised Elgarian grandeur. Deeply moving and well-worth getting to know. The third movement scherzo skitters and glitters, occasionally exploding in Beethovenian grandeur. Some of this exuberance reminds me of Walton in his mock medieval moments in the Henry V film music. A grand sauntering long melody unwinds at 2:30 in track 3 and there are engaging exchanges between violins and woodwind. There is a dignified sadness about all this music which, by the way, also sounds extremely well orchestrated with every strand coming through a transparent web of sound. The string writing occasionally boils in that peculiarly intense lyricism which I associate with Gerald Finzi. The symphony ends in a dramatically heavy display and with thunderous hammer blows. The Little Symphony is only little in the sense than it runs just over 20 minutes. It was premiered in Berlin in 1957 conducted by Leo Blech. Vaughan Williams string-writing in all its yearning is recalled at 1:11 but this is mixed with passages which might have been written by the Sibelius of the Fourth Symphony. The second movement is lithe and athletic with a touch of Malcolm Arnolds chirping flutes. The adagio is densely and sombrely written for strings with interjections by the winds. The last movement return to a vigorous muscular allegro (essentially light-hearted) seeming to step from the same world as the Wiren Serenade for Strings. Heart-easing and sincere music, beautifully constructed. A Festival Overture is another cracking British concert overture which would be happy in any anthology. In fact a dedicated record company could easily assemble a whole CD of Jacob overtures of this type. It is interesting to recall that this overture was premièred at the Proms (London) conducted by the composer in an atmosphere already chilling towards this type of music. Someone has claimed that the overture sounds like Malcolm Arnold. I dont see it. There is certainly a touch or two of E J Moeran and perhaps Reizenstein in this but Arnold would have been even more over the top and raucous. The Munich Orchestra and Douglas Bostock seem greatly at ease in the idiom and are never less than convincing. Apparently Lyrita (always glacially slow at releasing their material) have already recorded one of the two symphonies and plan in due course to issue a CD containing both works. The programme notes (German and English) are written by Eric Wetherell whose Thames book on Jacob is THE reference on this enigmatically ignored and exposed composer. The playing time of just short of an hour is shortish measure but forgivable given the rarity and quality of the music.